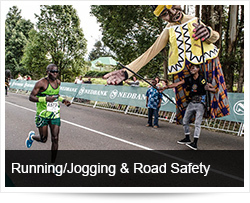 Road Safety is a concern not only for motorists but also for other road users such as pedestrians, cyclists and runners. Running injuries are quite common but can be reduced through proper conditioning and training programs; wearing the appropriate apparel and footwear and being aware of the running environment. Plan a progressive running program to prevent injuries. A five-minute warm-up (which should raise your temperature by one degree) followed by stretching exercises, is essential before starting a run. Start your run with the body feeling " a little cool " since body temperature will increase when you start running. Remember to drink some fluid prior to running and every 20 to 30 minutes along your route. When running, if you become dizzy, nauseated, have dry skin or the chills...stop running and try to get a drink. If you do not feel better, get help. If you have a heart or respiratory problem or you are on any medication, consult with your doctor about running in the heat. Also, if you have a history of heat stroke/illness, run with extreme caution. Children should limit their running in the heat due to their lower tolerance of heat. In high altitudes, runners should gradually acclimate themselves to lower oxygen levels, by slow, steady increases in speed and distance. Dress appropriately - Respect the cultural norms of the society that you are in. In countries where women dress in loose clothing that covers them completely, avoids form-fitting jogging clothing. When selecting a running shoe, look for good shock absorption and construction that will provide stability and cushion to the foot. Wear sunglasses to filter out UVA and UVB rays, and wear a hat with a visor to shade your eyes and face. On very windy days goggles or eyeglasses can provide additional protection. Always carry some form of identification in a wrist pocket and some change for a phone call. Also include information on any allergies, blood group, medical fund and contact number of next of kin. If travelling alone and staying at a hotel, carry a card with the hotel phone number and address. Do not wear headsets when running alone on the street – do not wear anything which distracts you. You need to be completely aware of your environment. Research has shown that high visibility clothing is effective at improving drivers' awareness of the presence of runners and cyclists. If drivers are aware of other road users just a fraction of a second earlier then they can take evasive action that can prevent an accident. If you aren't seen, the consequences are often tragic. Light coloured clothing is safer than dark colours. Fluorescent and reflective strips provide increased driver awareness once you are in the beam of the car headlights. Take a whistle with you. Traffic: When you run outdoors, traffic will be a hazard. Let others know where you will be running, and stay in familiar areas, away from traffic if possible. Run on the side of the road facing traffic -run preferably in the early mornings when traffic is sparse and exhaust fumes are few and far between. Always give traffic right of way and watch for those crazy overtaking speedsters who don’t care about runners. Try to get a running partner - If staying at a hotel, ask the concierge for nearby, safe running routes, or possibly a school track. Caution another runner in case you find one is not being mindful of something you think is basic—it could save someone from getting injured. Do not run at night, but if you run at dusk or dawn, wear reflective material. Whenever possible, run on a clear, smooth, resilient, even, and reasonably soft surface. Avoid running on hills, which increases stress on the ankle and foot. When running on curved surfaces, change directions in forwarding movement, so that you have even pressure on both feet during the run. Avoid unpopular areas, deserted streets, lonely trails - and especially avoid unlighted routes at night. Run in familiar areas. Be aware of emergency phones and how they work, note the location of neighbours you trust along with your route. Be careful of the terrain and aware of possible potholes and cracks in the streets and sidewalks that can cause major injury. Always stay alert and aware of what's going on around you. The more aware you are, the less vulnerable you are. Think about possible escape routes in case of a confrontation. Take notice of who is ahead of you and who is behind you. Know where the nearest public sites are with some general activity - there is usually safety in numbers. When in doubt, follow your intuition and avoid potential trouble. If something seems suspicious, do not panic, but run in a different direction. Run clear of parked cars, bushes, dark areas. Be extra vigilant at junctions with alleyways where traffic may emerge. Run across the street at crosswalks and always pay attention to traffic lights. Drivers have a bad habit of not looking for pedestrians. Be sure to make eye contact before crossing in front of a car. Never assume you have been seen! Be considerate of other road and pavement users - do not force pedestrians into the road - do not step off the pavement without checking behind - cyclists do not make a noise! Be aware of other hazards such as forces of nature, animals etc. Use discretion in acknowledging strangers. Look directly at others and be observant, but keep your distance and keep moving. Do not approach a car to give directions or the time of day. Point toward the nearest police or information source, shrug your shoulders but keep moving. If you feel you must respond, do it while moving. Running on the road is part of being healthy - let us avoid the dangers on the road and focus on those aspects that will help us to arrive alive and without injury.